Life is full of wonderful adventures with your 14-inch doll. 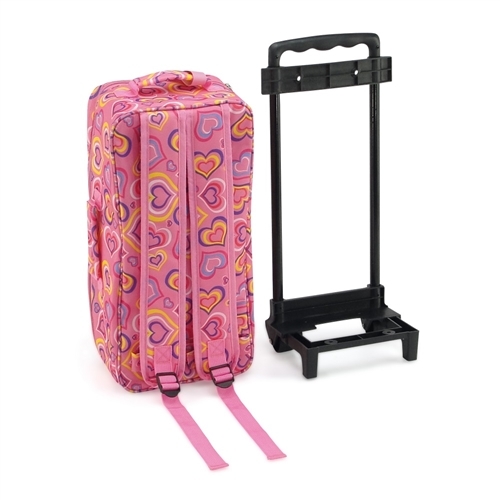 Travel from place to place in comfort and style with this ultimate, complete, transforming doll carrier, luggage, and bed set. Display your doll in this durable and wipe-able, pink travel case, and mark it as your own using our adorable pink name/address tag. The case has a bright and beautiful heart-shaped pattern, includes two straps: one secures your doll in the bed and the other secures the bed in the travel case. On the inside, there's amazing extra storage with multiple compartments for clothing and accessories. Your American Girl doll will rest easy and snug on your next trip with matching bedding (blanket and pillow). The best part is that this transforming carrier, designed to be easy to wipe clean, comes with a removable wheeled trolley and backpack straps for increased comfort and portability. 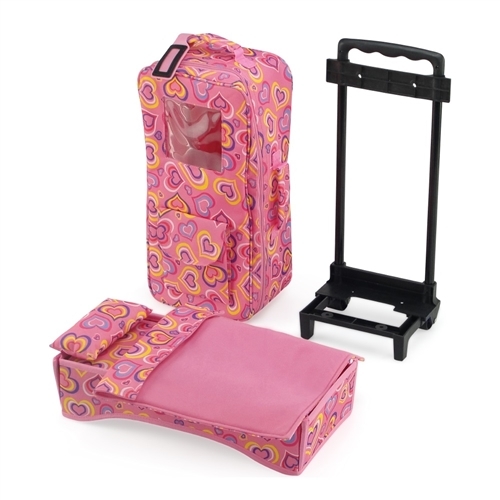 This super durable free-standing pink doll travel carrier case is a perfect closet on wheels for your 14" doll; includes loads of storage for doll clothes and accessories. Includes heavy duty detachable wheeled trolley and backpack straps for transport versatility, and the beautiful patterned fabric can be easily wiped clean! Includes an adorable pink doll bed and matching bedding (pillow and blanket). Traveling case measures 16" x 8" x 6". Doll accessory made to fit 14-inch dolls such as American Girl Wellie Wishers ®, Hearts for Hearts Girls, Glitter Girls, etc. Doll, doll clothes and doll shoes not included.